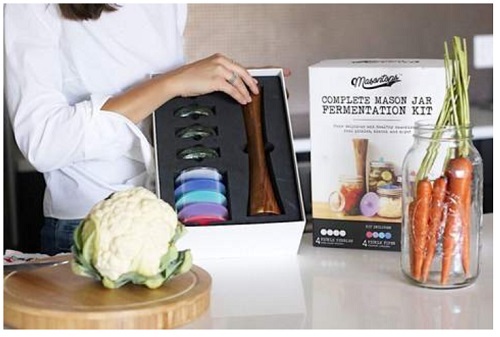 It’s so easy and economical to make fermented vegetables like Kimchi, Sauerkraut and Kvass with our Masontops Vegetable Fermentation Range and Caldwell’s Vegetable Starter Culture. Fermentation is first and foremost a means of preservation; it is the original form of pickling! Fermentation allows you to preserve a season’s harvest to enjoy later in the year. It creates healthy lactic acid that gives foods a bright, tangy flavor. Lactic acid functions as a digestive aid – tangy pickles served at a meal help to whet the appetite and stimulate the production of digestive juices. It helps to keep our stomach and bowels at the proper pH. Lactic acid is also deadly to pathogens, making fermentation the safest form of food preservation. by the bacteria, allowing us to absorb all the good nutrition with little digestive effort. 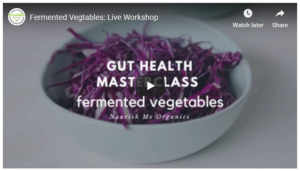 Raw fermented foods also contain live lactic acid bacteria. Some of these bacteria are considered to be probiotics, meaning they can take up residence in our gut and help bolster our microbiome. Fermentation was a happy accident! Thousands of years ago, workers building the Great Wall in China packed some cabbages with salt in a pot, hoping to preserve them. When they opened the pot later they found it bubbling and teeming with fermenting goodness, and a delicious sour flavor. That basic method of preserving vegetables in a salty brine spread around the world, so that nearly every culture with access to salt makes some kind of fermented food. The two ingredients needed to make fermented foods are: fresh vegetables and salt. So simple! The fresh vegetables provide the necessary bacteria and carbohydrates, while the salt has multiple functions in a ferment. First, salt exerts osmotic pressure on the vegetables, pulling the water out of them and then moving into the cells to take its place. This helps to create a brine, and also makes the vegetables firmer. Salt also inhibits spoilage organisms that would turn our vegetables into rotten mush instead of fermented goodness. Vegetables submerged in a salty brine soon begin bubbling with the fermenting activity of a variety of lactic acid bacteria. These bacteria consume the sugars in the vegetables, excrete lactic acid, and also produce carbon dioxide. They acidify the brine quickly, to inhibit any competition from spoilage organisms. To Brine, or Not to Brine? Dry salting refers to mixing finely sliced, chopped, or shredded vegetables with salt and letting them macerate to release their juices. Sauerkraut is the classic dry salted ferment. When dry salting vegetables, shred them very finely with a sharp knife, grater, or mandoline slicer. The shredded vegetables are mixed with salt, and then pounded and packed firmly in a jar. They release their juices, which submerges them and starts the healthy fermentation process. Dry salted vegetables work well with 1 tablespoon fine grind salt per 900g of vegetables, which will fit in a 1 quart mason jar. Brining is used when you want to leave the vegetables whole, or in sticks or chunks. Dill pickles are the classic brined ferment. For brining, large pieces of vegetables are packed tightly in a jar, and then a salt water brine is added to cover them. For brined ferments, plan on using about 450g vegetables per 1 quart jar, and about 2 cups of brine. Standard brine strength is 1 teaspoon salt per cup of water, which works well for most vegetables. Veggies that have a high water content, such as cucumbers or peppers, need a stronger brine – for these use 1.5 to 2 teaspoons salt per cup of water.